Editor’s Note: Yoweri Museveni has served as the President of Uganda for the past 25 years, during which time he has interacted repeatedly with Col. Moammar Gadhafi. For a profile of Museveni, click here. The unedited article below solely expresses the views of President Museveni. By the time Col. Muammar al-Gadhafi came to power in 1969, I was a third-year university student at Dar-es-Salaam in Tanzania. We welcomed his rise because he was a leader in the tradition of Col. Gamal Abdul Nasser of Egypt who had a nationalist and pan-Arabist position. Backing Idi Amin: Idi Amin came to power in 1971 with the support of Britain and Israel because they thought he was uneducated enough to be used by them. Amin, however, turned against his sponsors when they refused to sell him guns to fight Tanzania. Unfortunately, Gadhafi, without first getting enough information about Uganda, jumped in to support Idi Amin. He did this because Amin was a "Muslim" and Uganda was a "Muslim country," where Muslims were being "oppressed" by Christians. Amin killed a lot of people extrajudicially, and Gadhafi was identified with these mistakes. In 1972 and 1979, Gadhafi sent Libyan troops to defend Amin when we [the Uganda National Liberation Front] attacked him. I remember a Libyan Tupolev Tu-22 bomber trying to bomb us in Mbarara in 1979. The bomb ended up in Nyarubanga, Burundi, because the pilots were scared. They could not come close to bombing their intended target properly. We had already shot-down many of Amin's MIGs using surface-to-air missiles. Our Tanzanian brothers and sisters were doing much of this fighting. Many Libyan militias were captured and repatriated to Libya by Tanzania. 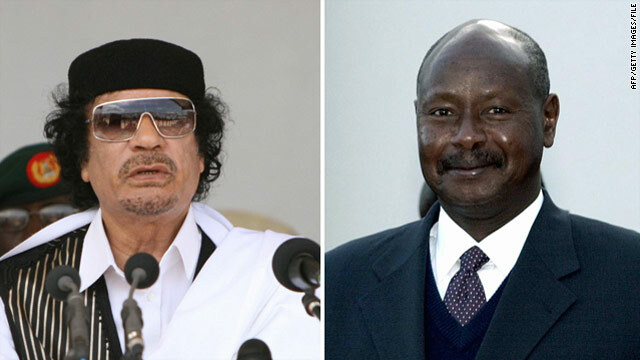 This was a big mistake by Gadhafi and a direct aggression against the people of Uganda and East Africa. Pushing for a United States of Africa: The second big mistake by Gadhafi was his position vis-à-vis the African Union (AU), where he called for a continental government "now." Since 1999, he has been pushing this position. Black people are always polite. They, normally, do not want to offend other people. This is called obufura in the Runyankore language, or mwolo in Luo - handling, especially strangers, with care and respect. It seems some of the non-African cultures do not haveobufura. You can witness a person talking to a mature person as if he or she is talking to a kindergarten child. "You should do this; you should do that; etc." We tried to politely point out to Gadhafi that continental governance was difficult in the short and medium term. We should, instead, aim at the Economic Community of Africa and, where possible, also aim at Regional Federations. But Gadhafi would not relent. He would not respect the rules of the AU. Topics or discussions that had been covered by previous meetings would be resurrected by Gadhafi. He would "overrule" a decision taken by all other African heads of state. Some of us were forced to come out and oppose his wrong position and, working with others, we repeatedly defeated his illogical position. Proclaiming himself king of kings: The third mistake has been the tendency by Gadhafi to interfere in the internal affairs of many African countries, using the little money Libya has compared to those countries. One blatant example was his involvement with cultural leaders of black Africa - kings, chiefs, etc. Since the political leaders of Africa had refused to back his project of an African government, Gadhafi, incredibly, thought that he could bypass them and work with these kings to implement his wishes. I warned Gadhafi in Addis Ababa that action would be taken against any Ugandan king who involved himself in politics, because it was against our Constitution. I moved a motion in Addis Ababa to expunge from the records of the AU all references to kings (cultural leaders) who had made speeches in our forum, because they had been invited there illegally by Colonel Gadhafi. Ignoring the plight of Southern Sudan: The fourth big mistake was made by most of the Arab leaders, including Gadhafi to some extent. This was in connection with the long suffering people of southern Sudan. Many of the Arab leaders either supported or ignored the suffering of the black people in that country. This unfairness always created tension and friction between us and the Arabs. However, I must salute Gadhafi and President Hosni Mubarak for travelling to Khartoum just before the referendum in Sudan, during which time they advised President Omar al-Bashir to respect the results of that exercise. Terrorism: Sometimes Gadhafi and other Middle Eastern radicals do not distance themselves sufficiently from terrorism, even when they are fighting for a just cause. Terrorism is the use of indiscriminate violence - not distinguishing between military and nonmilitary targets. The Middle Eastern radicals, quite different from the revolutionaries of black Africa, seem to say that any means is acceptable as long as you are fighting the enemy. That is why they hijack planes, use assassinations, plant bombs in bars, etc. Why bomb bars? People who go to bars are normally merrymakers, not politically minded people. We were together with the Arabs in the anticolonial struggle. The black African liberation movements, however, developed differently from the Arab ones. Where we used arms, we fought soldiers or sabotaged infrastructure but never targeted noncombatants. These indiscriminate methods tend to isolate the struggles of the Middle East and the Arab world. It would be good if the radicals in these areas could streamline their work methods in this area of using violence indiscriminately. These are some of the negative points in connection to Gadhafi as far as Uganda's patriots have been concerned over the years. Each of these positions taken by Gadhafi have been unfortunate and unnecessary. Nevertheless, Gadhafi has also had many positive points, objectively speaking. These positive points have been for the good of Africa, Libya, and the Third World. Gadhafi is a nationalist: Gadhafi has conducted an independent foreign policy and, of course, also independent internal policies. I am not able to understand the position of Western countries, which appear to resent independent-minded leaders and seem to prefer puppets. Puppets are not good for any country. Most of the countries that have transitioned from Third World to First World status since 1945 have had independent-minded leaders: South Korea (Park Chung-hee), Singapore (Lee Kuan Yew), China People's Republic (Mao Tse Tung, Chou Enlai, Deng Xiaoping, Marshal Yang Shangkun, Li Peng, Jiang Zemin, Hu Jintao), Malaysia (Dr. Mahthir Mohamad), Brazil (Luis Inacio Lula da Silva), Iran (the Ayatollahs Khomeini and Khamenei), etc. Between World War I and World War II, the Soviet Union transitioned into an industrial country, propelled by the dictatorial but independent-minded Joseph Stalin. In Africa, we have also benefited from a number of independent-minded leaders: Colonel Nasser of Egypt, Mwalimu Nyerere of Tanzania, Samora Machel of Mozambique, and others. That is how southern Africa was liberated. That is how we got rid of Idi Amin. The stopping of genocide in Rwanda and the overthrow of Mobutu Sese-Seko in the Democratic Republic of the Congo were as a result of efforts of independent-minded African leaders. Gadhafi, whatever his faults, is a true nationalist. I prefer nationalists to puppets of foreign interests. Where have the puppets caused the transformation of countries? I need some assistance with information on this from those who are familiar with puppetry. By contrast, the independent-minded Gadhafi had some positive contributions to Libya, I believe, as well as Africa and the Third World. Take just one example: At the time we were fighting the criminal dictatorships here in Uganda, we had a problem arising of a complication caused by our failure to capture enough guns at Kabamba on Feb. 6, 1981. Gadhafi gave us a small consignment of 96 rifles, 100 anti-tank mines, etc., that was very useful. He did not consult Washington or Moscow before he did this. This was good for Libya, for Africa, and for the Middle East. We should also remember as part of that independent-mindedness the fact that he expelled British and American military bases from Libya. He raised the price of oil: Before Gadhafi came to power in 1969, a barrel of oil was 40 American cents. He launched a campaign to withhold Arab oil unless the West paid more for it. I think the price went up to $20 per barrel. When the Arab-Israel war of 1973 broke out, the barrel of oil went up to $40. I am, therefore, surprised to hear that many oil producers in the world, including the Gulf countries, do not appreciate the historical role played by Gadhafi on this issue. The huge wealth many of these oil producers are enjoying was, at least in part, due to Gadhafi's efforts. The Western countries have continued to develop in spite of paying more for oil. It therefore means that the pre-Gadhafi oil situation was characterized by super exploitation of oil producing countries by the Western countries. Gadhafi built Libya: I have never taken the time to investigate socio-economic conditions within Libya. When I was last there, I could see good roads, even from the air. From the TV pictures, you can even see the rebels zooming up and down in pick-up trucks on very good roads accompanied by Western journalists. Who built these good roads? Who built the oil refineries in Brega and those other places where the fighting has been taking place recently? Were these facilities built during the time of the king and his American and British allies, or were they built by Gadhafi? In Tunisia and Egypt, some youths immolated themselves because they failed to get jobs. Are the Libyans without jobs also? If so, why are there hundreds of thousands of foreign workers? Is Libya's policy of providing so many jobs to Third World workers bad? Are all the children going to school in Libya? Was that the case in the past - before Gadhafi? Is the conflict in Libya economic or purely political? Possibly Libya could have transitioned more if they encouraged the private sector further. However, this is something the Libyans are better placed to judge. As it is, Libya is a middle income country with a GDP of $62 billion. He's a moderate: Gadhafi is one of the few secular leaders in the Arab world. He does not believe in Islamic fundamentalism, which is why Libyan women have been able to go to school, to join the army, and so forth. This is a positive point on Gadhafi's side. First, we must distinguish between demonstrations and insurrections. Peaceful demonstrations should not be fired upon with live bullets. Of course, even peaceful demonstrations should coordinate with the police to ensure that they do not interfere with the rights of other citizens. However, when rioters are attacking police stations and army barracks with the aim of taking power, then they are no longer demonstrators; they are insurrectionists. They will have to be treated as such. A responsible government would have to use reasonable force to neutralize them. Of course, the ideal responsible government should also be one that is elected by the people at periodic intervals. If there is a doubt about the legitimacy of a government, and the people decide to launch an insurrection, that should be the decision of the internal forces. It should not be for external forces to arrogate themselves that role; often, they do not have enough knowledge to decide rightly. Excessive external involvement always brings terrible distortions. Why should external forces involve themselves? That is a vote of no confidence in the people themselves. A legitimate internal insurrection, if that is the strategy chosen by the leaders of that effort, can succeed. The Shah of Iran was defeated by an internal insurrection; the Russian Revolution in 1917 was an internal insurrection; the Revolution in Zanzibar in 1964 was an internal insurrection; the changes in Ukraine, Georgia, and so forth - all were internal insurrections. It should be for the leaders of the resistance in a given country to decide their strategy, not for foreigners to sponsor insurrection groups in sovereign countries. I am totally allergic to foreign, political, and military involvement in sovereign countries, especially the African countries. If foreign intervention is good, then, African countries should be the most prosperous countries in the world, because we have had the greatest dosages of that: the slave trade, colonialism, neo-colonialism, imperialism, etc. But all those foreign-imposed phenomena have been disastrous. It is only recently that Africa is beginning to come up, partly because we are rejecting external meddling. External meddling and the acquiescence by Africans into that meddling have been responsible for the stagnation on our continent. The wrong definition of priorities in many African countries is, in many cases, imposed by external groups. Failure to prioritize infrastructure, for instance, especially energy, is, in part, due to some of these pressures. Instead, consumption is promoted. I have witnessed this wrong definition of priorities even here in Uganda. External interests linked up, for instance, with bogus internal groups to oppose energy projects for false reasons. How will an economy develop without energy? Quislings and their external backers do not care about all this. Second, if you promote foreign backed insurrections in small countries like Libya, what will you do with the big ones like China, a country with a system different from the Western system? Are you going to impose a no-fly zone over China in case of some internal insurrections, as happened in Tiananmen Square, in Tibet, or in Urumqi? Third, Western countries always use double standards. In Libya, they are very eager to impose a no-fly zone. In Bahrain and other areas where there are pro-Western regimes, they turn a blind eye to the very same or even worse conditions. We have been appealing to the United Nations to impose a no-fly zone over Somalia - so as to impede the free movement of terrorists linked to al Qaeda, which killed Americans on September 11th, killed Ugandans last July, and have caused so much damage to the Somalis - without success. Why? Are there no human beings in Somalia, as there are in Benghazi? Or is it because Somalia does not have oil that is not fully controlled by the Western oil companies, as in Libya on account of Gadhafi's nationalist posture? Fourth, the Western countries are always very prompt in commenting on every problem in the Third World - Egypt, Tunisia, Libya, etc. Yet, some of these very countries were the ones impeding growth in those countries. There was a military coup d'état that slowly became a revolution in backward Egypt in 1952. The new leader, Nasser, had ambitions to oversee the transformation of Egypt. He wanted to build a dam not only to generate electricity but also to help with the ancient irrigation system of Egypt. He was denied money by the West because they did not believe that Egyptians needed electricity. Nasser decided to raise that money by nationalizing the Suez Canal. He was attacked by Israel, France, and Britain. To be fair to the United States, President Eisenhower opposed that aggression that time. Of course, there was also the firm stance of the Soviet Union at that time. How much electricity was this dam supposed to produce? Just 2000 megawatts - for a country like Egypt!! What moral right, then, do such people have to comment on the affairs of these countries? Fifth, the by-now-entrenched habit of the Western countries over-using their technological superiority to impose war on less developed societies, without impeachable logic, will ignite an arms race in the world. The actions of the Western countries in Iraq and now Libya are emphasizing that might is "right." I am quite sure that many countries that are able to will scale up their military research, and in a few decades, we may have a more armed world. Weapons science is not magic. A small country like Israel is now a superpower in terms of military technology. Yet 60 years ago, Israel had to buy second-hand Fouga Magister planes from France. There are many countries that can become small Israels if this trend of Western countries overusing military means continues. Sixth, all this notwithstanding, Col. Gadhafi should be ready to sit down with the opposition, under the mediation of the AU, with the opposition cluster of groups which now includes individuals well known to us. I know Gadhafi has his system of elected committees that convene to form a National People's Conference. Actually, Gadhafi thinks this is superior to our multi-party systems. Of course, I have never had time to study how truly competitive this system is. Anyway, even if it is competitive, there is now, apparently, a significant number of Libyans who think that there is a problem in their country's governance. Since there has not been internationally observed elections in Libya, not even by the AU, we cannot know what is correct and what is false. Therefore, a dialogue is the correct way forward. Seventh, the AU mission was unable to enter Libya because the Western countries started bombing the day before they were supposed to arrive. However, the mission will continue. My opinion is that, in addition to what the AU mission is doing, it may be important to call an extraordinary summit of the AU in Addis Ababa to discuss this grave situation. Eighth, regarding the Libyan opposition, I would feel embarrassed to be backed by Western war planes. Quislings of foreign interests have never helped Africa. We have had a copious supply of them in the last 50 years - Mobutu Sese-Seko, Houphouet Boigny, Kamuzu Banda, etc. The West has made a lot of mistakes in Africa and in the Middle East in the past. Apart from the slave trade and colonialism, they participated in the killing of Patrice Lumumba, until recently the only elected leader of the Democratic Republic of the Congo, the poisoning of Cameroonian political leader Felix Moummie, and the assassination of Prime Minister Bartholomew Boganda of the Central African Republic. The West supported UNITA in Angola, Idi Amin - at the beginning of his regime - in Uganda, and the counter-revolutionaries in Iran in 1953. Recently, there has been some improvement in the arrogant attitudes of some of these Western countries. Certainly, with black Africa and, particularly, Uganda, the relations are good following the fair stand the West has taken on the fate of the black people of southern Sudan. With the democratization of South Africa and the freedom of the black people in southern Sudan, the difference between the patriots of Uganda and the Western governments had disappeared. Unfortunately, these rash actions on Libya are beginning to raise new problems. They should be resolved quickly. Ninth, if the Libyan opposition groups are patriots, they should fight their war by themselves and conduct their affairs by themselves. After all, they easily captured so much equipment from the Libyan Army, why do they need foreign military support? I only had 27 rifles. To be puppets is not good. Tenth, as to the international community, the African members of the Security Council voted for this resolution on Libya. This was contrary to what the Africa Peace and Security Council had decided in Addis Ababa recently. This is something that only the extraordinary AU summit can resolve. It was good that certain big countries in the Security Council - Russia, China, Brazil, and India - abstained on this resolution. This shows that there are balanced forces in the world that will, with more consultations, evolve more correct positions. Eleventh, and finally, being members of the United Nations, we are bound by the resolution that was passed, however rushed the process. Nevertheless, there is a mechanism for review. The Western countries, which are most active in these rushed actions, should consider that route. It may be one way of extricating all of us from possible nasty complications. What if the Libyans loyal to Gadhafi decide to fight on? Using tanks and planes that are easily targeted by French President Nicolas Sarkozy's planes is not the only way of fighting. Who will be responsible for such a protracted war? It is high time we did more careful thinking. Next entry »Are millennials isolationists? Powercorrupts, but absolute power corrupts absolutely. Gaddafi should blame his actions even though he may fall. His weakness is extremism, which he could not control, now everybody has known this. His mind-set, ignorance, greed and possessive nature deprived him of a golden opportunity to make history in the world. l strongly belief that Col Gadhafi the dictator has informed his friend Mr Museveni to lander his image. the ganging up of external forces and attack on Libya is a violation of Fundamental Human Right. Yurvri Museveni you are praising Ghadafi because you are like him, extending your time in office from two term to three term to indefinitely. But the Uganda constitution says two term in office before Museveni came to power. Now Museveni change it. As much as am not your fun, I totally agree with you on most of your points. Its true the western powers have always had double standards. They have uncoordinated foreign policies depending on there interests. They have got almost everything wrong when it comes to Africa, there rush actions on Africa have been detrimental and not helpeful. They have continued to give aid to Africa but closed there markets in regard to trade. Someone was talking about kill the gay bill....in most African cultures, being gay is an abomination and thats our business...but the western media is always very fast to comment about everything without knowledge. Its OK to be gay in Europe or USA, africans have never commented on it...so you people give us some respect, we have heard enough from you. A revolutionary leader like Museveni whom we fondly call as many names as M7, Seevo, Mpenkoni among others is rare in today political era. I am wondering why America which is killing many and many people in foreign soils is never prosecuted??? Look at Iraq, Afghanistan, how many people have lost lives due to their brutality? God forbids. Thank you Mr. President for sharing your revolutionary views for our beloved Africa. Now we hear Mr. Ban Ki Moon calling for cease fire! I agree with much of what the President of Uganda wrote and I believe that even though I am from Australia, I sincerely believe that you cannot trust the majority of Western nations including Australia, why? because even we citizens of such nations cannot trust what our governments do supposedly in our name. If you look carefully at the videos depicting the several million which have marched recently in libya such as Tripolli the other day, try and find the fanatical stereo typed muslim that the west so often portreys. To the contrary, you find many well dressed people in fact whole families who despite over 100 days of bombing by the NATO and USA aggressors, are looking relatively cheerful and content. These people are in control of their own destiny and are not going to let pathetic traitors from within nor the aggressors from Western alliances take this freedom from them again. This is not about Gaddafi at all, this is about a small group of people made up of CIA, Alqaeda etc. and other rebels who are funded for long time by the west to destabilise Libya and seek to destroy its rich diverse culture and plunder what has been built by Libyans over the last few decades. the West hates the progress made by Gaddafi and Libyans in seeking to bring an end to the plight of black people regarding discrimination and colonial exploitation. The West is now embarrassed that the witnesses it paid 4 million dollars each to lie about Libyas involvement in the bombing over Lockerbie. Remember this regarding Lockerbie, every Libyan was framed by the west as a terrorist when in fact it was not the case. Some of the paid witnesses are now comming forward to state how they were coerced into giving such evidence agaist Gaddafi and Libya. We now know also that the Gulf of Tonkin incident which led to the Vietnam war was a lie also. Over 500 of my Australian brothers and sisters were killed in that war because of a lie. This war is for Libyans and Libyans only to take care of. Those Libyans that agree with the west, are traitors, and are weak and pathetic children of Satan. Stand and fight for your land against the NATO and USA aggressors you pathetic cowards or suffer the consequence that Egyptians, Tunisians and other nations have had to suffer in the past because of the puppets the west/ and or Israel have put into place during those periods. Do you all want to end up cursed like those living in Iraq or Afganistan, because this is what happens when you let the West intrude into your affairs. Yoweri Museveni rants on and on he sure isn't no Robert Mugabe; he made some good points, however how could he be for Gaddafi and be against him at the same time. Museveni is definitely one of the many examples of so-called African leaders whom are scared of a united Africa because it will diminished their insignificant faces at the UN as you know that many of these African states really have no say on the world stage. African Leaders like Museveni are so naive to know a Federate state of Africa would increase their individual strength than his little banana republic or clusters of banana republic. I am really disappointed in Museveni; and that such a letter could be coming from a leader of an African country. Africa needs a fast tract federation so it can stand up to the rest of the world, and not what Museveni suggested. The problem with Museveni is that he can't put the past behind. I thinks Museveni have much to learn; if we had five leaders like Gaddafi on the African continent, Africa would be a much better place. Museveni can't come close to Gaddafi and or accomplish the many things that Gaddafi accomplished in 40 years, He is so insignificant he can't even feed the people of Uganda, or pay Uganda's fees at the UN and must rely on foreign fiat money to do so. Mr president we all know the no big difference between you and late gadaffi in terms of being greed for power, and American couldn`t turn to a blind eye when the mad dog marcyless tyrant dictetor was killing his own people. Today 34 Million Ugandans all has this same question. HOW IS IT POSSIBLE FOR A PRESIDENT WHO IS NOT A DICTETOR TO RULE HIS COUNTRY FOR 26 YEARS? IS HE GOOD AS AN ANGEL? you can defend your self by sayig that you have been elected all this time and in Uganda the is no term limits, and you can compere Uganda to some of European countries where the is no term limits. but in european countries where the is no term limit have you seen in any of those countries being ruled by one president for 26 yr ? are you better than anyone in this countries? how good are you Mr President?